This artifact is speculated to be so extremely old that part of the wooden handle has turned to coal. Coal is known to take millions of years to form, so then how is this possible? How old could this strange artifact actually be? This stone is located in a scenic area in Zhangbu village, China. This incredible carving is thought to be a staggering 270 million years old?! There are different versions of the writing that essentially translates to €œCommunist Party of China€. 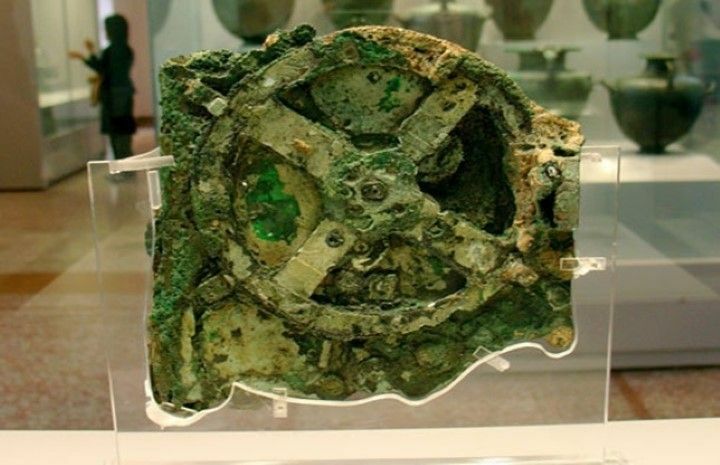 This is an incredible 2,000-year-old astronomical calculator built by ancient Greeks! This spectacular mechanism is far more advanced than anything that was built in the following ten thousand years or so. How did they have the knowledge to create something so intricate? – The stone’s age, purpose, and origin are unknown. It was found in the late 1800s by a few working men digging a fence post. The carvings on one side of the stone show an image of corn and several other unknown figures. The other side is more abstract, featuring pictures of arrows, a moon, some dots and a spiral. What do you think these mean? This artifact is astonishing because it’s origins and language are completely unknown and is said to be the handwritten diary of an alien! Packed full of plant life, strange symbolism and diagrams, it is covered in a mysterious language that can’t be traced back to any known civilization. I suggest doing some more researching into this particular fascinating artifact. See what the images make you think of and maybe you could decode it’s meaning! Alright this is a good one. These 2,000 year old batteries were found in Khujut Rabu just outside Baghdad. People were creating batteries that long ago?! These artifacts show that our people of the past were so much smarter than we give them credit for. These batteries were able to create a low current electrical stream to power €“ what exactly? This is a strange world map designed in 1513 by Piri Reis. It was created far before any kind of aerial viewing technology existed. The map shows parts of the western coast of Africa, the eastern coast of South America, and the northern coast of Antarctica. How is this possible?! Hot air balloons? Remote viewing? You be the judge! There is an assortment of over 3,000 perfectly carved rounded stones. There is no solid explanation as to why, how, or when they were placed there. How did these balls get carved so smoothly without the use of any advanced technology? There is so much more going on in our world than we are being taught. Do you think discoveries like these should be discussed in schools more openly? When we can see the value in showing all angles of humanities past €“ then we can collectively put the puzzle pieces of Earth’s past together. Check out this video explaining more about these amazing discoveries!